Marc Marquez has been warned to show his MotoGP rivals more respect after his involvement in an incident with Repsol Honda teammate Dani Pedrosa at the Motorland Aragon track last month saw him hit with one penalty point. Marquez made the faintest of touches with the back of Pedrosa’s factory RC213V at the previous round while the pair were chasing down Jorge Lorenzo in the early stages of the Motorland Aragon clash. The contact though sliced through a rear wheel speed sensor cable and disabled Pedrosa’s sophisticated traction control system. The result was less than a second after the contact, Pedrosa was viciously high-sided out of second position and the incident effectively ended his world title aspirations for another season. Both Marquez and Pedrosa attended a hearing at the Sepang track in Malaysia this afternoon from which the outcome was the reigning Moto2 world champion being hit with a one-point penalty. That takes his tally to three now after he was given two points for missing a yellow flag in the warm-up at Silverstone. His RC213V flew into the gravel trap and just missed a group of marshals attempting to clear Cal Crutchlow’s Monster Yamaha Tech 3 YZR-M1 after he’d fallen just moments earlier. Taken in isolation, it is clear that the Marquez and Pedrosa incident in Spain would have been dismissed as a racing incident and no action would have been taken. But Marquez has repeatedly been involved in close calls on the brakes in his incredible rookie season and Race Director Mike Webb admitted it was time to send out a warning that his strategy must change in the future. Marquez is now just one penalty point away from having to start a race this season from the back of the grid, so asked by MCN how the sanction was agreed in Malaysia today, Race Director Mike Webb said: “The simplest way to say is that Race Direction is sending messages. 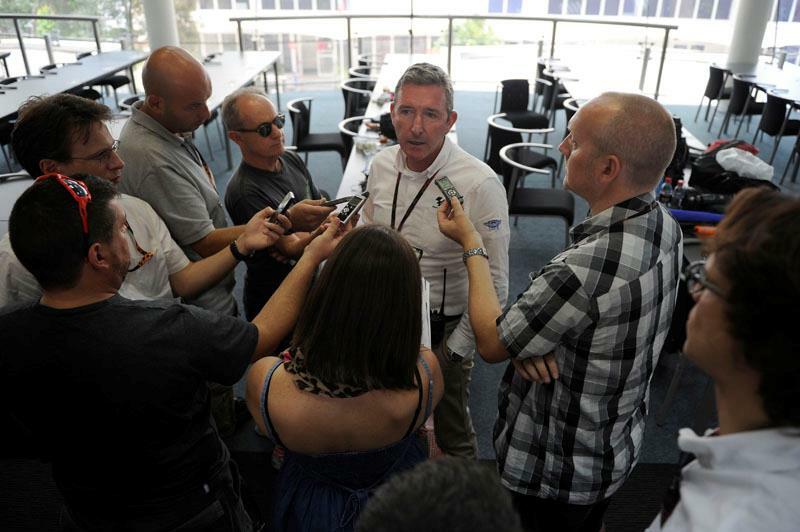 The one-point for Marc is a formal warning to people to understand the type of behaviour on track we are looking for. Even though the contact itself was quite minor, the consequences were rather large and it is a question of how close Marc can be, especially on braking to another rider in front of him. It is the responsibility of the rider behind to make sure he doesn’t contact or get in the way of the rider in front. And after a number of instances this year we have finally had a contact because Marc has been quite close to another, so it is the right time to send a message and say that is not what we are looking for and please can you take more care. Marc can continue with the same riding style that we all love to watch but it is only a question of respecting the space and riders around him a little more. His riding style can continue as long as there is enough in reserve. The four-member Race Direction panel, which also includes ex-racer Loris Capirossi, studied data from both Marquez and Pedrosa’s machinery to see if they had done anything to contribute to the contact. As part of the Marquez sanction, the 25-points Honda got in the constructor world championship for his Aragon victory were stripped too. As a result of the contact at the Motorland Aragon, all Honda machinery in Sepang features a temporary carbon protector over the previously exposed rear wheel speed sensor cable and Webb explained the HRC penalty.